Rarely will a film leave me curious enough about its source material to lead me to consider reading the book it’s based on, but that’s what happened with this movie. 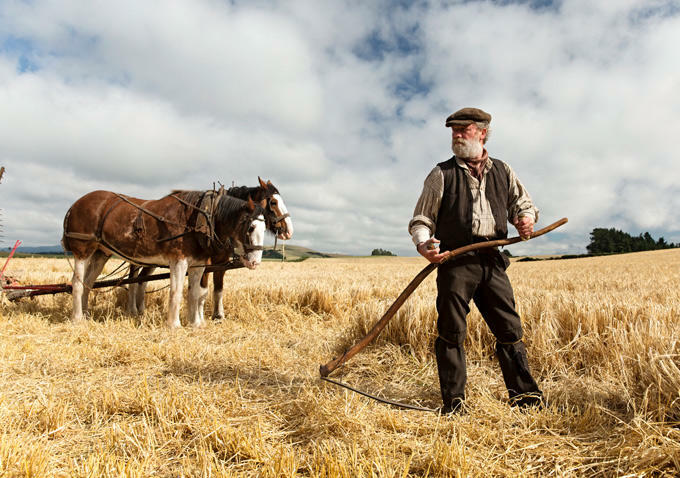 So enraptured was I by British auteur Terence Davies beautiful and tender “Sunset Song”, that I found myself curious about the beloved 1932 novel of the same name by Scottish writer Lewis Grassic Gibbon. I’d never heard of it, despite the fact that there have been numerous stage versions and TV adaptations prior to this film version that Davies had secured financing for back in 2000. 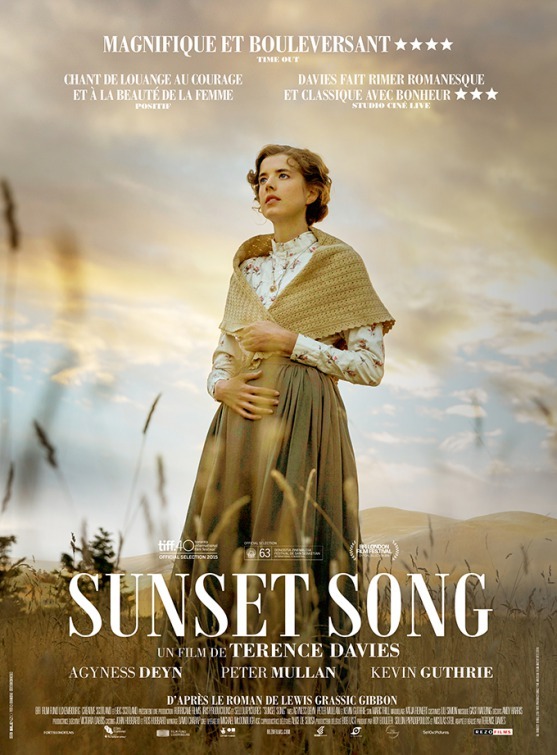 On that note, I hadn’t even seen a film by Davies before viewing his vividly shot “Sunset Song”, which features evocative tragedy and sensitive longing in a kind of old school genuine manner that just isn’t found in theaters anymore. The coming-of-age story is set in the northeastern Scottish highlands in the early 1900s and follows Chris Guthrie (a mesmerizing Agyness Deyn), the strong-willed 19-year-old daughter of cantankerous and abusive farmer, John (Peter Mullan) who lives a life of hard work on their remote property, the Blawearie, amid the fictional community of Kinraddie. Her mother, Jean (Daniela Nardini) is emotionally and physically broken after producing six children for her abusive husband, even delivering twin boys well into her middle-aged years. Chris, who longs to be a teacher, is left to confide in her brother, Will (Jack Greenless), but even he is squashed under the cruel tyranny of their father, despite his justifiably insubordinate manner. He leaves as soon as he can and the There’s also a friendship she has with one of Will’s friends, the stalwart Chae Strachan (Ian Pirie) who often drops in, but there is a pervasive entrapment that Chris experiences as well. She turns to her love of the land as an escape and solace from the gender expectations that are thrust upon her. Eventually, she is left as the sole caretaker of her family’s land and Chris finds herself wondering if she’ll ever come out from the weight of life and find love. That’s when Ewan Tavendale (Kevin Guthrie) a kind and polite young man from a nearby glen who begins to court Chris. She’s understandably hesitant at first, considering the environment she was raised in and we watch as their relationship develops at its own natural pace, possibly providing the needed love she’s wanted her for years. They get married, have a boy named Ewan and then comes the Great War, which calls seemingly every man off to the battlefield, regardless whether or not they will it. Once again, Chris faces more challenges, some seemingly unbearable with sombre turns that question her family’s future, but her determination and resilience remains. What is immediately apparent as “Sunset Song” opens is how gorgeous the film looks. It’s as Davies and cinematographer Michael McDonough (“Starred Up” and “Winter’s Bone”) studied up on the works of American realist painters Winslow Homer and Nathaniel Wyeth as well as French painter Jules Breton. The vast golden fields of wheat where we first see Chris walking with billowing clouds above her are romantic, like pages of literary classics coming to life on the screen. These outdoor scenes were shot on film in 70mm, while the interior shots were digital, getting a pristine hi-def look at the shadows and light of the earth-tone home life. The overall look of the film pulls viewers in and finds us more interest in the characters who inhabit this world, regardless of whether they are cruel or kind. It is indeed the characters that pull us into the story here and Davies trusts both his actors and the audience to see the richness, vitality and authenticity offered them. The only actor I recognized prior to viewing was Peter Mullan, one of my very favorite actors (see “My Name is Joe” and “The Claim” and then any of his other performances). Mullan can play despicable characters in his sleep, yet there is always something going on underneath his skin that leaves viewers with an undeniable curiosity as they watch the Irish actor work. As John, Mullan is fascinating, portraying a cruel and pathetic authoritarian, demanding respect but never earning it. He provides a horrible male figure in Chris’ life, but it sharpens her determination and resourcefulness. That makes every other actor a delightful discover for me. 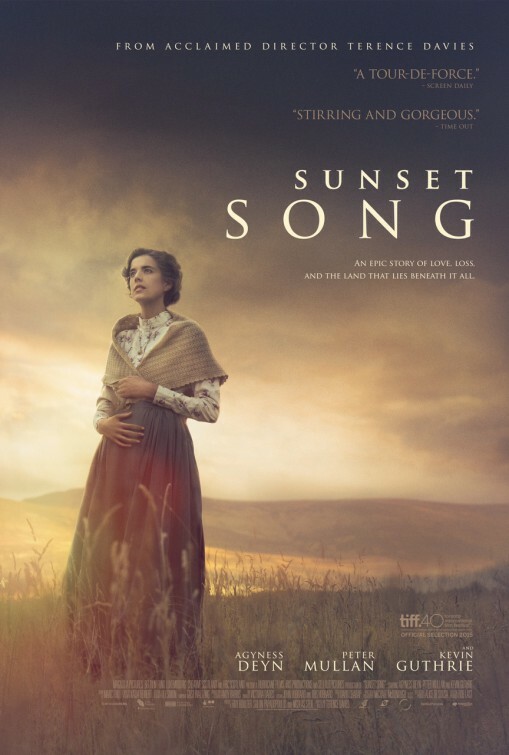 “Sunset Song” certainly relies on Agyness Deyn to carry the film and she provides Chris with a quiet dignity and gentle beauty. She and Davies carefully work her characters struggle with her own identity and sexuality, never making it an overbearing or provocative element to Chris’ characterization. What I found delightful was Chris’ narration in certain parts of the film. This was surprising to me since I don’t feel narration is needed or always works in film, but hearing Deyn’s Scottish brogue accent poetically reflect on her life during certain parts of the story is like a meditational page turning in this three-chapter story. In her voice we hear a woman who has survived loss and frustration, who has lived through the story we are witness to. It’s not clear if she is free of the hardship and the struggles of life, but she can clearly look back on her life and see a tale worth telling. “Sunset Song” does have a flaw in its third act and thats’ where Davies tells (instead of show) how war has strained the marriage between Chris and Ewan. Up until then Guthrie has done a fine job as Ewan, the patient, gentle and loyal man Chris longs for. He’s the stand-up, kind guy we want her to have too. But these last thirty or so minutes of the film is missing an added element that would really connect the downward spiral his character takes. It’s as if Davies is eager to finish the picture and aims to jar us to the end. This dramatic misstep is unfortunate, but I can’t say it ruins the experience leading up to it and the power of the acting throughout. “Sunset Song” may be formulaic, but it succeeds in so many areas that comes together as an ode to those old sweeping epics that move our hearts. It celebrates how the sombre and heartbreaking moments in life can be seen alongside the beauty and power of nature, reminding us that there are always highs and lows in our journey. The world can be uncaring and humans can be miserable, but there is always the possibility of happiness and strength amid it all.